For Your Inner Geek - I Will Derive! A colleague from the Math Department shared this with me. Very funny. Here's an update on Dean Kamen's Luke Arm from this week's All Things Digital conference. You can see earlier versions here. In this new video, we see one of the testers feeding himself for the first time in 13 years! Really inspiring! If you've got kids or students that you want to interest in engineering or technology - have them watch this. Here's a really great marketing/promotional piece from San Diego State University. It's a Machinima (Machine+Cinema) created to promote their Educational Technology program. As Second Life and other virtual worlds become more mainstream, I think we're going to see more and more uses such as this. I have an ongoing discussion with our marketing department and our marketing users group (MUG) about starting to use some of these new - new to most - tools in marketing the college, courses, and programs. Among the tools we've discussed are Facebook and MySpace, Twitter, Friendfeed, Blogs, Podcasts, iTunesU, RSS, YouTube/GoogleVideo/TeacherTube/etc, and SecondLife. I think this video provides a great way of introducing these concepts on to your campuses and mine. Great line from the New York Times David Brooks! My first thought on the running mate question is that to balance his ticket, Barack Obama should pick a really old white general. Therefore, he should pick Dwight Eisenhower. John McCain, on the other hand, needs to pick someone younger than himself. Therefore, he also should pick Dwight Eisenhower. More on Personal Branding - From a Student! Earlier I posted a link to some personal branding advice for students. The post focused on developing an online brand - in particular for job seekers. Jess Neill, a junior at the University of Georgia studying advertising, new media and English, makes a strong case for building your brand not only as you're preparing to graduate, but throughout your time as a student. Everyday in the classroom I see students who are good students, and that’s all they are. When they go to their professor to ask for a recommendation for this internship or that job, they’ll get a good recommendation. Good recommendations are a dime a dozen, and won’t hold up to competition. What you want is a spectacular recommendation. At then end of the course, you want to have formed a relationship with your professor, keeping in mind that every interaction you have is a chance to reinforce your personal brand. Your personal brand starts from day one. Show up to class. On time. Participate, but don’t dominate. Professors can see straight through BS; they see enough of it. Every time you comment it should add something other than noise to the class discussion. Talk to your professors outside of class. If the human part didn’t matter, the class would be a set of PowerPoints and textbooks. Just keep your personal brand in mind at all times. What are the first words that you want to hear when they talk about you to someone else? Be polite, friendly and enthusiastic. By the way, Jess has been selected as a summer intern with marketing writer/guru Seth Godin. Sound's like it will be a blast! The title today is a re-working of Bill Clinton's 1992 campaign mantra - "It's the economy, stupid." It comes from an interesting Op-Ed from Roger Cohen in the New York Times that details how Barack Obama's understanding of social networks - and Hilary Clinton's inability to grasp their importance - has been a critical factor in the race for the democratic primary. Learning is not easy. In particular, it's very difficult to keep students engaged and interested. One approach that seems to work is immersive learning - where students are immersed in the learning environment, rather that in a traditional classroom. For instance, consider this earlier post on teaching history in a virtual world. Here's another great example from a professor at Michigan State University. A professor at Michigan State University has created a free online video game to help students learn Chinese. 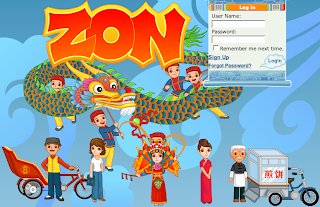 The multi-player role-playing game, Zon/New Chengo, allows users to choose Mandarin phrases to converse with other characters in the game about exchanging money, buying breakfast, and other activities visitors to China would experience. To learn more, play the game for free, or watch a video demonstrating the game. 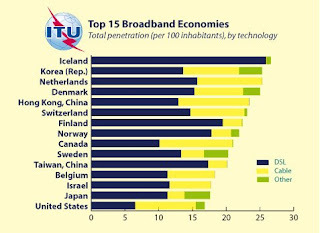 For the second year running, the U.S. ranked 15th among the 30 members of the Organization for Economic Cooperation & Development in terms of broadband availability. Denmark ranked first again in the annual OECD survey, followed by a host of European and Asian nations. Indeed, while the number of Americans with access to broadband service rose 20 percent last year, to nearly 70 million people, the most in the OECD, that amounted to just 23 of every 100 residents. By contrast, the top five countries in the OECD ranking all sport per-capita penetration rates of better than 30 percent. 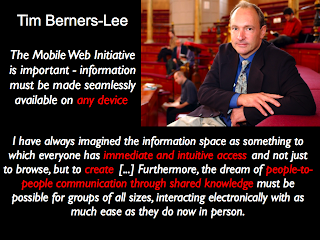 Tim Berners-Lee is credited with "inventing" the world wide web. This webcast might be worth putting on your calendar, if you're interested in where he sees the web going. ReadWriteWeb is the exclusive Media Partner for an interactive debate on the future of the Web, featuring Tim Berners-Lee. The event is June 11 and is being run by the Rensselaer Polytechnic Institute. The debate will address questions such as: Is net neutrality essential for democracy? What role does AI have in the future of the Web? What will Web 4.0 look like? Granular Social Networks or What's a Friend? Thomas Vander Wal is an incredibly forward-thinking guy. I met him about five years ago on a flight home from California. Thomas had just been visiting a company to pitch them the idea of folksonomy. As we were getting ready to take off, Vander Wal described his vision of folksonomy and social tagging. At the time, it was something I had never heard off, but exploded into my consciousness very soon after that. The idea - very crudely; Thomas explains it much better - is that rather than having experts or librarians label or categorize content, we instead have the community collaboratively tag or categorize the content. 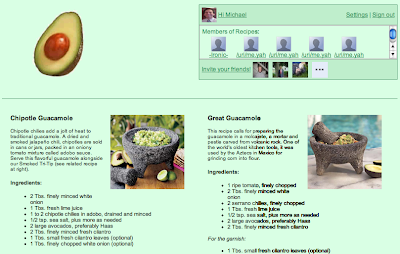 The concept has been used successfully by sites like delicious, magnolia, and flickr. But Vander Wal's concept is even broader and involves building a social network around that collaborative community. Here's what he described to me - in 2003. Imagine your cell phone equipped with GPS - i.e. it knows where you are. You're walking around the city around dinner time. Your cell phone knows what time you like to eat dinner and what type of food you like, so it alerts you as you approach potential places to eat. As you explore these restaurants, your "phone" searches your social network for reviews that your friends and friends of friends may have posted. Really groundbreaking concepts that are just beginning to be implemented. Vander Wal still has a lot to say, especially about the overwhelming explosion of social networks. Here's brief video he recorded on Granular Social Networks and how he describes it and a link to a more detailed explanation. An overview of the complexity in real social network relationships and visualization to help understand the key points that matter - people and interests. As part of a project I'm working on, we've purchased an island in Second Life and will be launching it later this summer for educational use. As I've started to discuss this with colleagues, I've found there are many who don't quite get it or have difficulty seeing the value of using virtual worlds in education. Here's something that may help. I received an announcement regarding this upcoming conference - entitled "Stepping into History: Exploring the Past through Virtual Worlds." The conference will be held entirely in Second Life on June 10, 2008. "In-World" attendance is limited to 60 participants; others may attend a virtual classroom simulcast. 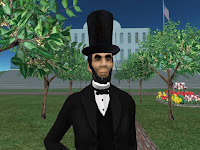 The highly interactive experience will include "field trips" into historical locations that have been created in Second Life. We will explore 19th century America, where participants will meet Abraham and Mary Todd Lincoln; Virtual Harlem, to hear live music from the Jazz Age/Harlem Renaissance; and Renaissance Island, for a Shakespearean play in a replica of London’s Globe Theatre. Everyone will discuss what they have experienced with simulation creators and other conference participants. The conference will continue with a panel discussion with a variety of experts and a late afternoon photo workshop. The program concludes with a period ball at the Lincoln era White House. What if instead of talking about history, we could experience it? What if, instead of looking at photos or drawings of historical sites, we could walk into and through them? What if, instead of reading the words of a Lincoln or a Ghandi, we could hear them speak? The technology of virtual worlds is opening up a new universe of possibilities in promoting and teaching a love of history. The 'Stepping into History' conference is your chance to learn about, and experience for yourself, the power of virtual worlds at the service of history. Here's a brief slideshare presentation from Personal Branding Expert (not sure how you become one of these) Dan Schawbel. In about 22 slides, Schawbel gives graduating students - or anyone looking for a new job - great advice on how to develop and maintain a personal brand. A few of the great tips - purchase yourname.com domain; develop a website - a virtual resume - that takes each section of your resume and makes them separate pages; by an inexpensive webcam, dress up and start getting video of yourself out there. 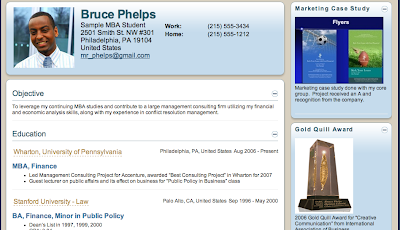 An alternative to the virtual resume is VisualCV, which I've blogged about before. Great post by Garr Reynolds at Presentation Zen: Brain rules for PowerPoint & Keynote presenters. if you want to learn how to be a great presenter, look outside the public-speaking and presentation-skills literature, and certainly look beyond advice on how to use ephemeral software apps like PowerPoint and Keynote. All of the information can be obtained by "clicking" on the bar code with a cell phone equipped with special software. Imagine using your cell phone to take a photo of a bar code in a restaurant ad and getting a map with the nearest location. A brief video (about 5 minutes) with a lot of interesting thoughts on teaching and learning in the 21st Century. US travelers to the city-state of Singapore now have the option of plugging in their iPhone or iPod for most of the trip, Singapore Airlines announced on Thursday. Effective immediately, certain long-distance flights will include special connectors to plug in dockable Apple devices and feed both audio and video to an in-seat entertainment system dubbed KrisWorld that will also keep the handhelds charged. The system is intelligent enough to momentarily override audio in the event of a cabin announcement, the airline says, but must be used in Airplane Mode by iPhones to prevent interference. Service starts with all Airbus A345 flights from Newark, New Jersey but should ultimately include all A340 airliners leaving Los Angeles starting from August and will spread to New York at a later date. In a recent post discussing Cell Phones in the Classroom, I referenced a presentation I gave to a colleagues' Intro to Digital Media class. A number of reader have asked for copies of the presentation - the original presentation was in keynote (think ppt on steroids). The conversion from keynote to ppt requires some post-processing that I haven't had time to do. In the meantime, I've converted the presentation to a PDF document and posted it on slideshare.net - with any embedded video removed. You can set the slideshow below and even download the PDF. You'll notice the presentation is short on text; instead focusing on lots of imagery and what I had to say - that's the direction my presentations have been heading. If I get a chance, I may record a screencast or add notes to the slideshow and repost - although I think many of the images you'll find self-explanatory. My fourteen-year old daughter has just discovered The Beatles. Not sure what she'll think of this! Click the link to listen and enjoy? Ever wonder what it would sound like if it was Bingo instead of Ringo? If it was Poodles instead of Paul? Fido instead of George? Or Rex instead of John? I love video from live events. It's real, spontaneous and connects better with the online audience - more so than a slideshow with a voice over narration. Unfortunately, most recorded talks suffer from slides that are either too hard to see or off screen when you need to see them. The solution may be Omnisio, which lets you combine online video from a variety of sources with a slides you've uploaded or imported from slideshare - one of my favorite sites! 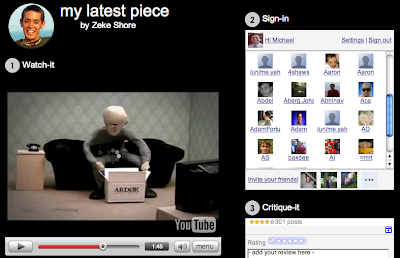 You can also use the site to combine a variety videos to create your own compilations or mixes. Yet another PhD turned comedian - I'm sensing a scary trend! For all the fellow academics - now that our semesters are nearly over, here's a great use of powerpoint by a PhD turned comedian. Attract more visitors. 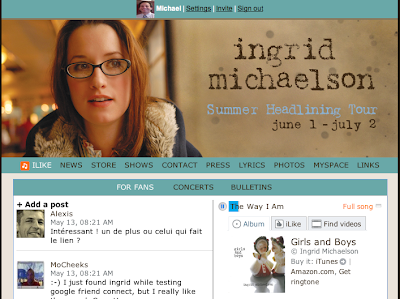 Visitors bring along friends from social networks like Facebook, orkut, and others to interact on your site. Enrich your site with social features. Choose engaging social features from a catalog of gadgets provided by Google and the OpenSocial developer community. No programming whatsoever. Just copy and paste snippets of code into your site, and Google Friend Connect does the rest. Watch the 10-minute video for more info, and click on any of the pictures below to view and explore some example sites. How did Google know I like Guacamole and dark humor? Ian Ayres raises a very interesting point. Should we have an explicit policy limiting laptop use during class to class-related activities only - unless a professor says otherwise? Or are we dealing with a generation of multi-taskers that can surf the web, play solitaire, IM their friends, and listen/learn - all at the same time? Or - at least with college students - are we dealing with adults who should be allowed to make their own choices? Lots of questions - few answers. My own take - if you engage your students, they will close their laptops! Several years ago I watched a particularly memorable “Law Revue” skit night at Yale. One of the skits had a group of students sitting at desks, facing the audience, listening to a professor drone on. All of the students were looking at laptops except for one, who had a deck of cards and was playing solitaire. The professor was outraged and demanded that the student explain why she was playing cards. When she answered “My laptop is broken,” I remember there was simultaneously a roar of laughter from the student body and a gasp from the professors around me. In this one moment, we learned that something new was happening in class. Data from Nielsen Online, 2008, available at Clickz. Jon Beasley-Murray is an Assistant Professor of French, Hispanic, and Italian Studies in the University of British Columbia (a magnificent campus, by the way). Each year, he assigns term papers to his students, but this year’s languages and literature learners demonstrated their research and learning in another way — by contributing to Wikipedia. The photos used are unimaginative and mostly shoved into corners of slides, with no thought whatsoever given to how they might be more evocative and more emotional. The irony here is that there are some truly excellent photos available at the Clinton website. In about one hour, I was able to produce an entire makeover of this slide deck, relying even on low-res screen grabs of website photos. Above all, this should not have been sent as slideware; it should have been a PDF document. Without a live person advocating these positions, the bulleted content is insufficient for fleshing out the argument. Given Clinton’s position as underdog, these arguments are too nuanced to be made by static bullet slides, especially poorly-designed ones. This deliverable should have been a completely-formatted document, created in InDesign or Xpress, or at a minimum, Publisher, with evocative photos, fully-formulated paragraphs, and integrated data charts. I've been following Ed Yourdon's blog for quite awhile now. I first discovered Ed through his Web 2.0 presentation at slideshare.net. 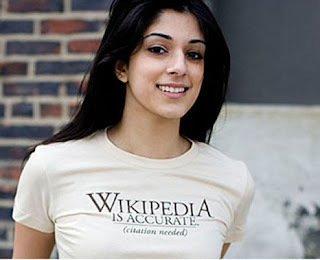 Whether you're a Web 2.0 veteran, or brand new to Web 2.0, Ed's presentation is worth a look. It's full of information, links to additional resources, and is updated all the time - this is currently version 51. Even better is that Ed doesn't just talk the talk - he buys into the openness and collaboration of Web 2.0. You can get the slides in PDF format, from slideshare or on Google Docs. The Google Docs version is where things get interesting. If you request, you can become a collaborator on the Google Docs version and begin adding your own content - that's why you see the author as Ed Yourdon and collaborators worldwide! Google has released basic software called Vidnik that lets Mac OS X users record video with a Webcam or built-in camera, trim its length, add tags and a title, then upload it to YouTube. How do YOU define social computing? Applications in which people connect with and draw strength from each other, rather than from traditional institutions like corporations. Similar to the way we define the groundswell. How do you identify what technologies are best when you're trying to launch a new product where there is no previous audience? We wrote a report on How To Choose The Right Social Technologies. Which ones you choose depends on your objectives. New iPhone Closer Than we Thought? 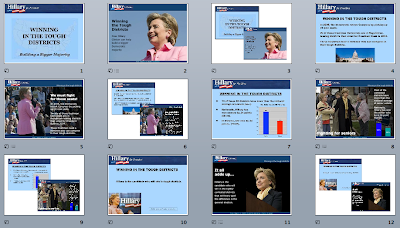 Garr Reynolds commenting on a PowerPoint deck on Hillary's electability sent to House Democrats. I love the term slideument to describe a printed PowerPoint slideshow intended to be read as a document. Nine slides, approximately 275 words, one table, three bar charts, and two pie charts. Why not just write a proper, concise, well-designed document and send it as a PDF? Unfortunately, sending this kind of docu-point/slideument as a quick alternative to a well-crafted paper or handout, etc. is all too familiar. John Gruber at Daring Fireball gives a great analysis comparing the BlackBerry to the iPhone. A must-read no matter which device you currently own or intend to buy. there’s no denying that Moore’s Law applies to handhelds, too. Eventually there will be a computer that fits in your pocket that is more powerful than today’s Mac Pros. But the path from here to there is riddled with difficult engineering problems — heat dissipation, battery life, and OS integration chief among them. when the iPhone’s upcoming enterprise features were announced, the iPhone can do more BlackBerry-ish things than the BlackBerry can do iPhone-ish things. Apple doesn’t wait for someone else to knock one of their hit products off its throne or slowly run it into the ground (cf. the Motorola Razr) — they do it themselves. For six years pundits have been declaring that competitors would “soon” catch up to the iPod, but the iPod has never been a static target — over the same six years Apple has released significant new iPods every year. 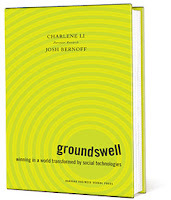 I just ordered a copy of this book, written by Forrester Research analysts Charlene Li and Josh Bernoff. The book explores the effect of Web 2.0 technologies on businesses. Among the technologies discussed are blogs, wikis and Wikipedia, YouTube, and social networking sites such as MySpace and Facebook. The objective of the authors is to get companies to look at these technologies not as a threat, but as an opportunity. 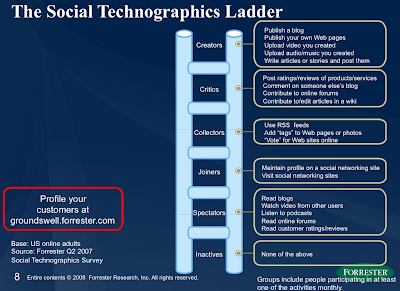 Here's a video from Forrester's Groundswell site and the Social Technographics Ladder referenced in the book and the video. June 29th 2007 - the day the original iPhone launched - was an historic day in the mobile phone industry and marks the birth of the mobile web. Around the same time this year - late June - we should see version 2.0 of the iPhone software, the iPhone apps store, and according to many pundits - a next-generation 3G iPhone. 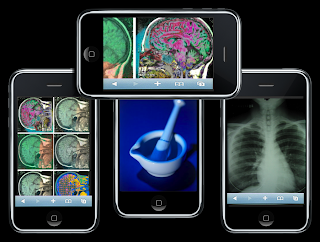 'If you could use the gesture-based way of manipulating images on the iPhone and actually manipulate a stack of X-rays or CT scans, that would be a huge selling point,' says Adam Flanders, director of informatics at Thomas Jefferson University and an expert in medical imaging. Pagers, laser pointers, cell phones, or other electronic devices not part of the instructional program will not be allowed in school. six schools in Brooklyn who have given cell phones to their students — a total of about 2,500. Each phone is preloaded with with 130 minutes of talk time. Students can be rewarded with additional minutes for good behavior, attendance, homework, and test scores. Teachers are using the phones to send text messages about assignments and upcoming exams. All of this within a school district (New York City Department of Education) that has banned cell-phones and other personal ICTs from schools. This slide is from a presentation I did recently on digital media. In the context of the presentation, the point of the slide is that many educators and school administrators fear digital media and its implications in the classroom. I continued -- rather than banning these new technologies that we as educators don't understand or haven't mastered, we should instead embrace these technologies and find ways to better engage our students using technologies that are second nature to them. I’m so fed up with these arguments. Paper clips are a distraction. Spiral notebooks are a distraction. And as we’ve seen recently, students certainly do NOT need a cell phone to cheat on an exam. So off the top of my head, I decided to rattle off a few things that cell phones could be good for. These are 10 great alternatives to banning cell phones in the classroom -- in particular, I like number eight, classroom response system because it's something I suggested to a colleague in lieu of buying a commercial system. > Do you stop class to answer your Grandma’s call? Neither should students. This is a no brainer. You should model appropriate cell phone usage for the students. No, social calls should not be taken during class. I don’t think you’d get an argument from anyone on that one. > I see the list that you put up for uses, but I’m sorry, who’s gonna pay for it? Who’s paying for it right now? 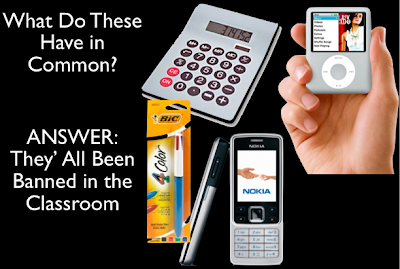 What % of your students have cell phones? Who pays the bills? Who buys the calculator your students use? Who buys their pencils and markers? Dont’ make the issue more complicated than it needs to be. If they HAVE a phone and they HAVE a contract, then I’m just saying that you should make use of it! Would you tell a student that has a graphing calculator “You can use it to add and subtract, but you can’t use it to graph because Johnny over there doesn’t have one.” Or tell them, “You can only use these 16 colors from your box of 64 crayons because not all students have the other colors.” Keep it simple. If they have it, leverage it. > What happens if there aren’t enough to share? Then they don’t use it. > What are other kids going to do? Learn the things that you’re teaching. And when they need to look up a word, use a dictionary or encyclopedia. >Who pays for it when Johnny drops Billy’s phone? That’s between Johnny and Billy’s parents. Who pays for it when Johnny drops Billy’s calculator? > Who pays for the minutes used during the day for web access or text messaging? Who pays for them now? No change. > If the school says you have to have it for a certain class, can you really make parents pay? Whoever said anything about requiring students to have it for a certain class? I’m not saying that you should make it required. I’m saying that we should stop banning it and leverage it whenever possible. >Is your school district going to by phones for students? 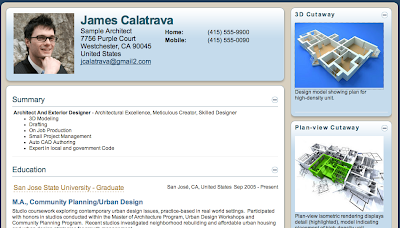 Guy's VisualCV is also a great example of what you can do with the service when you're not looking for employment. You can still put yourself "out there" and build a compelling bio to let the world know what you're up to. Over on the blog bavatuesdays, a professor tells of a visit yesterday to the University of Richmond for a lecture that was interrupted by a lockdown following reports of a gunman on the campus. As the audience sat in a dark, locked room awaiting their fates, hoping and praying that tragedy wouldn’t befall another Virginia university, they began communicating and comforting each other via Twitter." 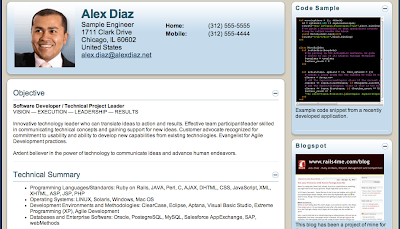 Here are some great sample CV from VisualCV. I love the idea of being able to include pictures of your work, blueprints, renderings, sample code - even a photo of an award you've won. As an academic, May is a very significant month. It signifies the end of classes, the beginning of summer recess (sounds good doesn't it), commencement (graduation for those outside the ivory tower) and job-hunting students. Yes students do eventually finish their degrees and seek gainful employment. One of my most rewarding tasks, as a faculty member, is to write letters of recommendation for my students and to help them fine-tune their resume or curriculum vitae. It's not uncommon now to fax or email a CV and cover letter to a prospective employer, but with students that are digital natives and living in a digital world, I'm surprised that CVs haven't gone Web 2.0. 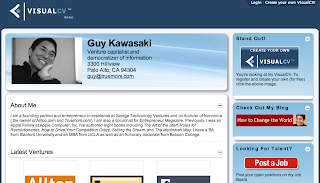 Here is a screen shot of Guy Kawasaki's VisualCV. VisualCV is a new service that enalbe users to create and share online resumes/CVs. It's really about time! Imagine the possibilities. You can point people to a living dynamic CV that is always up-to-date. You can embed pictures, video, links, writing samples ... just about anything - at least anything that's digital. So whether you're looking for a job yourself, helping your own child or helping a student - consider a VisualCV. Maker Faire is a two-day event/celebration dedicated to the Do-It-Yourself (DIY) crowd that just wrapped up (May 3rd and 4th) in San Mateo, California. Looks like a really fun event with lot's of creative people and innovative creations. A-list blogger Guy Kawasaki posted a ton of photos on his How to Change the World blog. The photo [courtesy of BoingBoing] shows a must-have for every uber-geek dad. 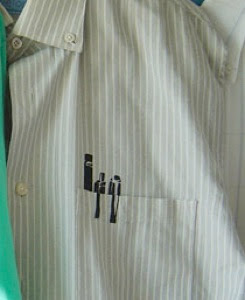 A dress shirt with printed pens in the pocket. Jeffrey R. Young in Wired Campus - an online publication from the Chronicle of Higher Education has a great interview with Loyola Marymount University junior Kelly Sutton. Kelly, and friends co-founded a popular student technology blog Hack College. Here are some snippets from the interview - Kelly has some really interesting insights. We personally believe that blogs are kind of replacing résumés as far as indicators of talent and past experiences. We’ve had a lot of job offers come directly from the blog itself. We definitely think more students should consider blogging. It’s no longer weird to spend a lot of time on the Internet. Students will jokingly admit to spending hours on Facebook. The habits that they’re forming right now will eventually lead to different collaborations that weren’t possible in the past. [Technology is] adding a lot of overhead to a student’s life — the time it takes to check all the social networks and online platforms. Oftentimes professors trying to use technology or plug into the generation using technology fail miserably. It’s like, “Let’s make a podcast.” Well, what problem is that podcast solving? I learned how to operate a computer before I learned how to ride a bike without training wheels. ... it’s just kind of been a part of my life ever since I was born. Testing Geography - Are You Smarter Than a 5th Grader? Dan Greenwood from our Teaching and Learning Center has been doing a 5-minute video podcast - Project EMIT: Engaging Methods in Teaching (TLC) - where he interviews some of our most innovative faculty describing new teaching and learning techniques they're exploring in their classrooms and with their students. Dan - in addition to recording and producing this podcast - is also responsible for much of the technical support provided to faculty by the TLC. In the 2-part video below, Dan interviews Professors Doug Coil and Art Marshall. This is not only a great example of cross-campus collaboration, but also demonstrates what faculty can do when they have the support and resource to bring their ideas to fruition.